31 March – Bob Dwyer’s Bix & Pieces: This band was warmly welcomed back after a fairly long absence. 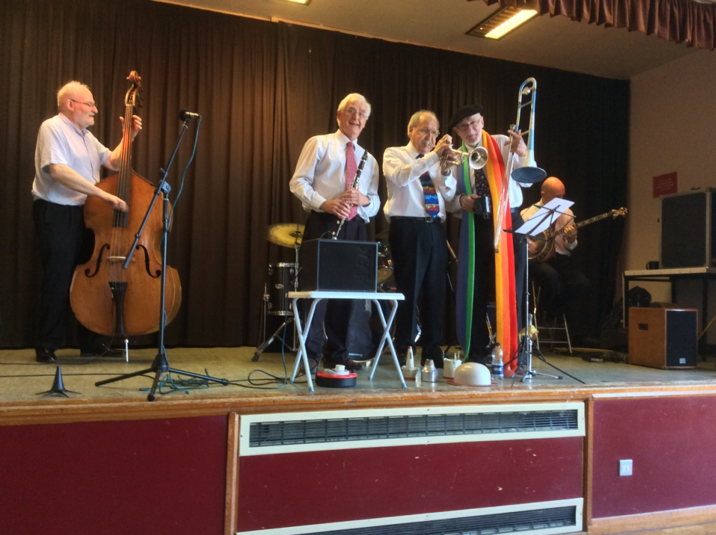 Leader and on trombone was Bob Dwyer, on reeds Sarah Spencer, Brian Bates was on trumpet, Hugh Crozier was on the piano, John Bayne was on double bass and bass saxophone and Nick Ward (a previous SJS Musician of the Year Award winner) was on drums. Numbers included “Oh Look at Her – Ain’t she Pretty”, “Strutting with some BBBQ”, “Putting on the Ritz”, “The Riverboat Shuffle”, “The Dada Strain”, “Little Coquette” and “Good Morning Blues”. A good concert with some classy playing. I hope we see them again soon. 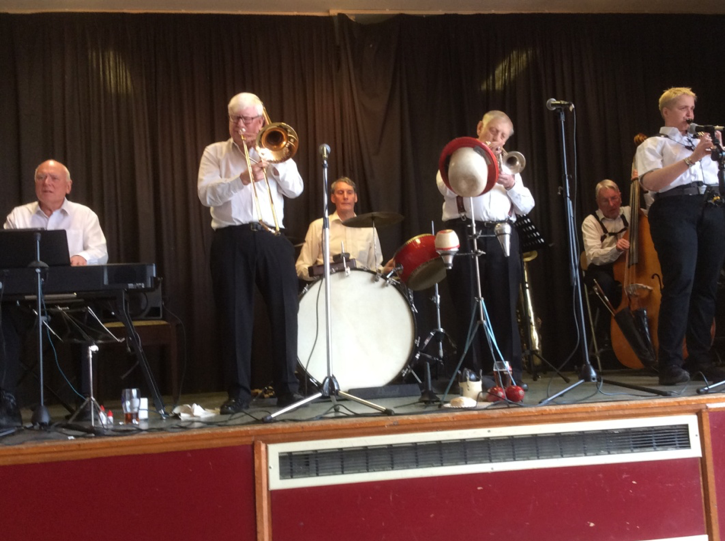 24 March – Eric Newton’s Willy’s Weepers: Welcome back to this lovely band: Eric Newton (leader) on reeds, the irrepressible Terry Brunt on trombone, Pete Ainge on trumpet, Peter Robinson on banjo/guitar, John Musket on bass and Chris Pendlebury on drums. They started with “Way Down Upon the Swannee River”, went on to a favourite of mine “Mood Indigo”, “I’m Nobody’s Sweetheart Now”, “My Indiana Home”, “China Town”, “Strutting with Some Barbecue” and “Won’t you Come Along With me to the Mississippi” to name but a few. During the second half they had a guest appearance by ex-N’Orleans Jazz Band – Ned Fogg now aged 86 – which was well received. The gig was rounded off with “Sheik of Araby”, just smashing. Although it does not show all the band members I so liked the posing of the front line that I chose it to represent the concert, which I think it does so well. 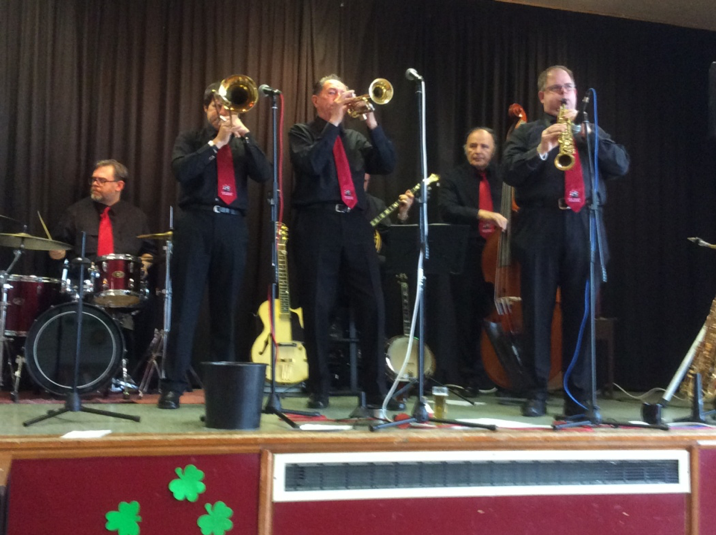 17 March – Dart Valley Stompers: Well the band opened with a storm with “Ain’t Misbehaving”. 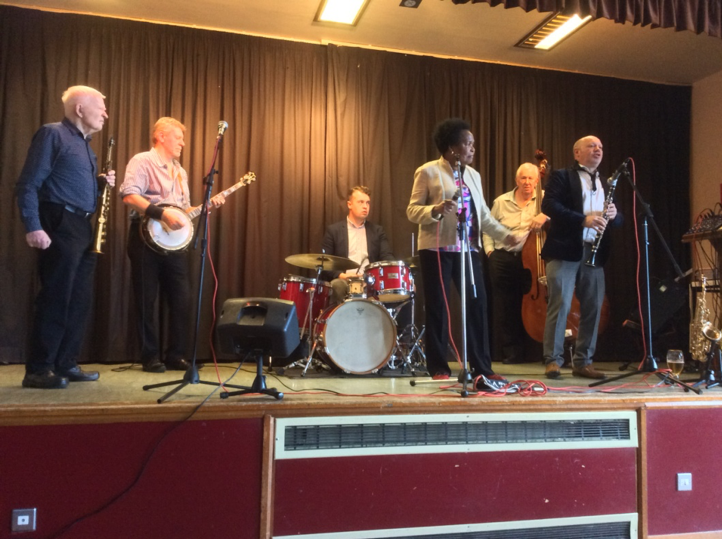 There was Jeremy Huggett (leader) on reeds and vocals, Kevin Grenfell on trombone, Graham Trevarton on trumpet, Howard Williams on Banjo/guitar, Keith Tolley on double bass and Chris Stockings on Drums. There was a bit of a leak on the stage but one resourceful musician used one of the brolly parade umbrellas as a temporary cover. Other numbers included “I’ve Got Your Number”, “I Found a New Baby”, “Some Day You’ll be Sorry”, “Isle of Capri, “Careless Love and “Sweet Georgia Brown” and of course “Bourbon Street” for the brolly paraders to name but a few. Thoroughly entertaining and I think we all look forward to seeing them again in the near future. 10 March – Matt Palmer’s Rhythmic Reeds with Christine Tyrrell: Matt is almost a regular now with one or another of his bands. This time along with Matt Palmer on reeds there was George Huxley on reeds, Mark Challinor of banjo/guitar/ukelele, Brian Lawrence on bass and Jack Cotterill on drums. Christine Tyrrell, a great favourite with Stafford Jazz Society, sang along with several numbers, including “Fair and Square in Love”, “In the Garden”, “I Just Couldn’t Keep it to Myself” and “My Mother’s Eyes” to name a few. The band also gave us several Sidney Bechet numbers including “Le Moulin de Café” (the coffee grinder) and “As-tu le cafard” (have you got the blues) together with “Who’s Sorry Now”, “Ain’t Misbehaving”, “Lover Come Back To Me” and “Some Like it Hot”. Great concert which was well received.